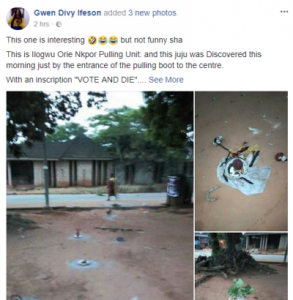 Anambra Poll: Charms spotted at Ilogwu Orie Nkpor Polling Unit with “Vote and Die” inscription – Royal Times of Nigeria. 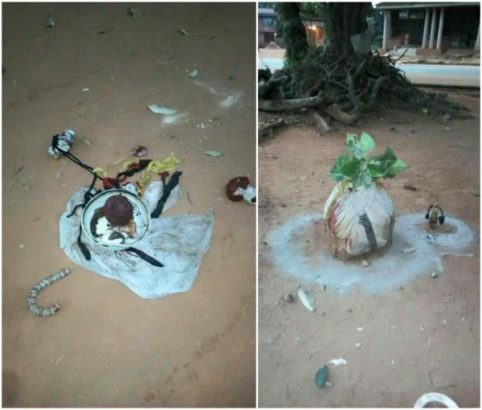 This is Ilogwu Orie Nkpor Pulling Unit: and this juju was Discovered this morning just by the entrance of the pulling boot to the centre. With an inscription “VOTE AND DIE”.